European Protein AS’ aims to promote sustainable farming through less use of antibiotics and zinc oxide in livestock production particularly for pigs and poultry. European Protein’s concept is based on the use of lactic-acid fermented protein feed combined with other important factors such as management, animal welfare, and microbiology. Our vision is to be the preferred supplier of protein feed to farmers and the feed businesses both nationally and internationally. Our mission is to spread fermented protein feed to farmers nationally and internationally. We believe that fermented protein feed is good for both the environment, health and economy. Our products are constantly evolving and together with our parent company Fermentationsexperts AS we search for ways to improve our products to make them even better for you and your animals. Designer Protein is a concept where the proteins are mixed based on your needs. All animals have their own specific protein/amino acid need. If you have special needs, we are able to develop new products to suit your concept if production permits it. In order to maintain the bacteria active, there may be moisture or liquid present. Therefore, different liquid/wet and dry protein products are mixed which is illustrated above. This way the liquid from various liquid commodities such as whey, sea weed, etc. are used in the processes. Thus, there are several advantages in the finished product, which pays for the drying of the raw material. 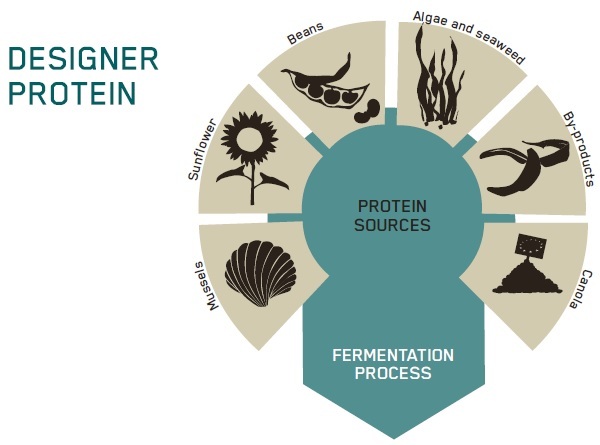 In our product development we have focus on alternative protein sources such as sea weed, algae, star fish, and mussels which we believe is one of the largest opportunities in order to address the challenges the world faces in the coming years in terms of sufficient access to protein sources. The planet’s population is growing every day with 240,000 people. Plant production cannot keep up, so there is a need for alternative protein sources. The sea hides many resources such as seaweed, mussels, and starfish. European Protein is able to take advantage of these raw materials in a designed protein. Starfish contains 40 – 50% protein. There are 500 species of seaweed in the Baltic Sea. There may be cultured from 1 up to approx. 20 times more seaweed per ha. in the sea. Protein rate varies depending on species from approx. 10 to 45% protein. European Protein is able to break down the cells of the seaweed and makes it digestible. Mussels have almost the same amino acid profile as fishmeal. It is possible to produce approx. 20 tonnes of mussel meal per ha in the sea. European Protein AS has the solution to sustainable agricultural production and many of the challenges in the world in this respect. According to the 17 UN Sustainable Development Goals, we want to contribute by taking care of our planet and exploiting the resources of the planet in a way that benefits all.